Stretching after spinning is necessary for reducing soreness, increasing flexibility, recharging the muscles, and preventing injury. 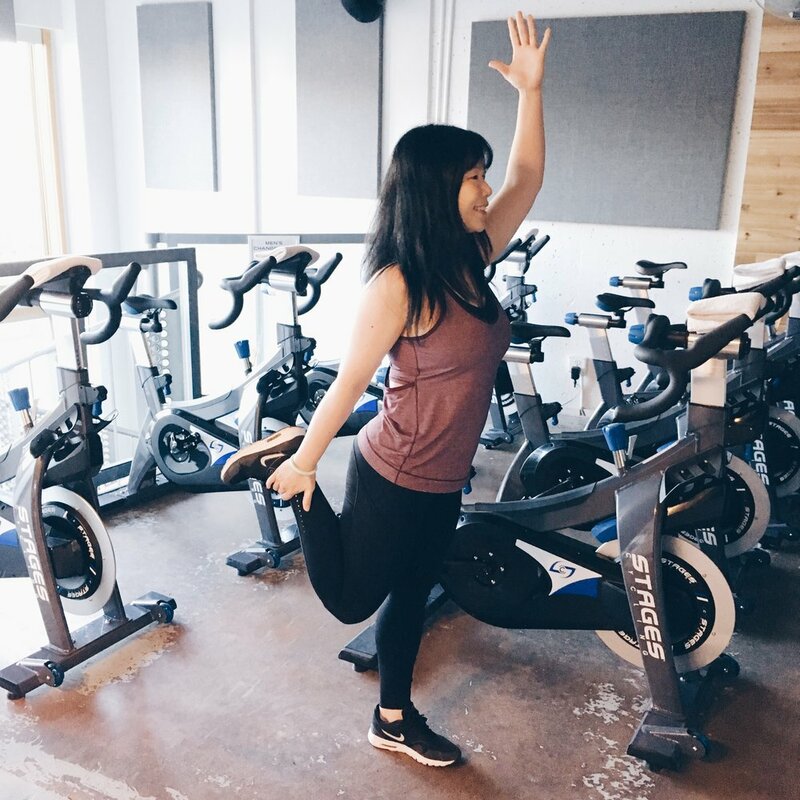 In our 45 minute class, we budget 4-5 minutes to cool down and stretch. We encourage you to make a bit of extra time later in your day to incorporate some of these sweet moves we are sharing with you. 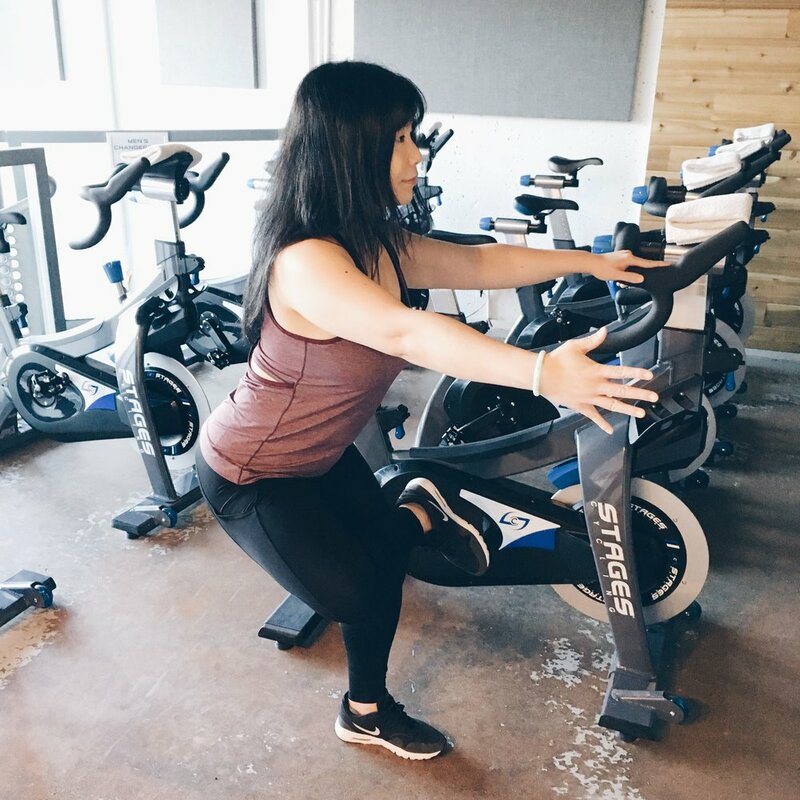 The key areas to target after a ride are your glutes, hip flexors, quads, hamstrings, and calves, but your upper body also needs some release after leaning forward on your bike. So, here are a few positions that allow you to target multiple areas at once! Your front knee is in a deep bend and your back leg is extended behind you with your heel raised from the floor. Your hands are up with your biceps beside your ears and your sternum is lifted to the sky. Hold on each side for 30-60 seconds. You are targeting the hip flexor of your back leg, while stretching the hamstring and calf of your back leg. 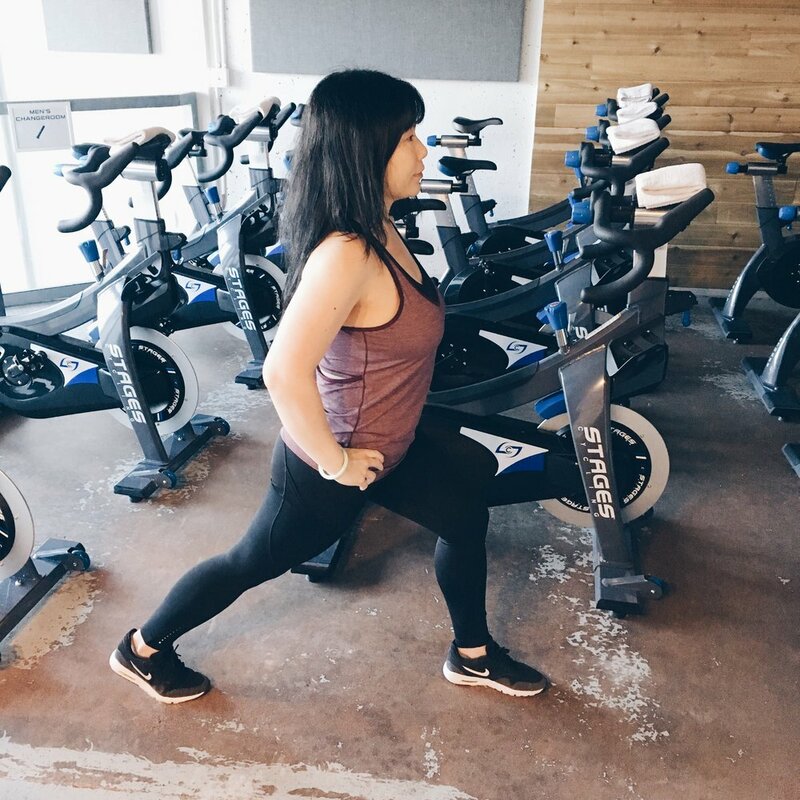 The spinal extension is a counter pose to the forward-leaning position you were holding on the bike, and should feel like a release through your upper back body as well as an opening for your chest. Your front knee should be stacked directly over the ankle, with your thigh bone almost parallel to the floor. Energize the back of your back leg up. Find space in your side body first with an inhale, and then breathe into the back of your rib cage while lifting your sternum to shine your heart up. Soften your shoulders. One shin bone is stacked on top of the other thigh bone with your knee out to the side. Your hips are pressing back evenly and you are hinged forward. Hold for 30 seconds on each side. You will mostly feel this in your glutes, as well as in the hip of your top leg. Try to get your thigh bone parallel to the floor, press your hips behind you, and hold a neutral spine as you hinge forward. Find opposition – let your bottom leg press up and your top leg be heavy. Hold your gaze on the floor ahead of you. One flexed ankle is in your hand with your knee pointing to the floor. The opposite hand is reaching up. You should feel a good stretch through the quadricep of your active leg, and a pull through your opposite side (ideally from foot to fingertips!). Your lifted foot is flexed to protect that knee, and your hand and ankle are pressing in toward each other. Keep your knee behind your hip, hug your inner thighs toward each other, and slightly tip up your hips. Your opposite hand is raised; energetically press your foundation foot through the floor and reach your fingertips up in opposition. Drop your shoulders away from your ears, and take big smooth inhales into the side of your waist. Hold on each side for 30-60 seconds. I have many more stretches up my sleeve and love to get hands on with guests who are looking to target a specific area or perfect a certain posture. Please find me after class if you have any questions or comments about how and why to stretch most effectively!